Urban Simplicity: Things That Can Be Carried On A Bike (#315)...and a couple of comments. Things That Can Be Carried On A Bike (#315)...and a couple of comments. The book, Wild Fermentation, a u-lock, a 6ft cable lock, and 19 bricks. 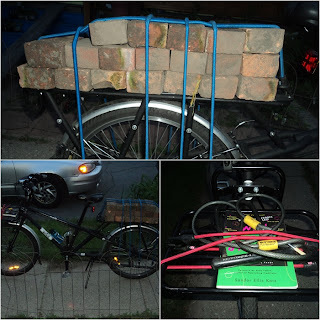 Firstly, no I did not think that those measly bungee cords would hold the bricks if I banked too far or hit a large bump...they mostly just kept them in place (and I surely did not want a repeat of what happened when I was carrying lumber in my truck the other day). I happened to come upon them as I was pedaling home this evening. Someone had put them out at the curb with their trash. I'm not sure what I plan to do with them but if you are like me and have an urban garden you know that you can never have enough bricks. Anyhow I took it very slowly and kept my eyes on the road directly in front of me looking for bumps or other disturbances...it is much easier to watch for these things when on a bike. Anyhow, because the bricks were varying sizes, the best I can figure (using a simple Google search) is that a brick weighs between 5lbs and 9lbs (2.2kgs to 4kgs), so if I took an average of 7lbs (3.1kgs) and multiplied it by 19 bricks we're looking at around 133lbs (60.4kgs) on the back of a bike. There are only a few bikes that can possibly handle this payload and I was glad to have been on my Mundo. Bikes are good for transporting us from place to place, bikes are good for leisure activity, and without doubt, bikes can also haul stuff. This is just one simple example. I too collect bricks. I have yet to pay for a brick and friends who know of my hobby often bring some to me, even at work. I have been known to fly with a brick in my suitcase. I have a lovely patio made from bricks I have found and am always on the lookout for more! I have not, however, yet transported them by bike - now I can see that it IS possible!! But I've never seen a load of bricks on a bike! I wouldn't have trusted the bungee cords, but I see, they are more reliable than I thought they would be. Yes, with a garden there is allways a need for bricks. I have about 30 of them in my garden waiting to be used. Stefan, Yes it's pretty cool isn't it...that a person can carry 60kg of bricks on a bike...but still not too much for a Mundo. Did you see that there is a v4 out? Thanks Joe for the hint for the V4. I can't really see the difference to the V3. For my V1 is only one year old and I spent a lot of money in customizing, I will stay with my V1 for quite a time. And if I should buy a new Mundo, I would probably prefer the Velonom Prana, wich is the german version of the V3, after Klaus Schroeder split from Benjamin Sarrazin. They build the frame in Germany. I don't like frame from Asia. Not for their quality but for social and environmental reasons. The V4 is lighter. They keep shaving weight off. The primary changes I believe is in the rear rack losing another set of tubes.I too have the V1 frame, and if I can lose 19 lbs I might swap out frames, as it will offset the increasing weight of my children and their bikes. Evidently the V3 is 11 or 12 lbs lighter than the V1, is that right? As far as bricks go, count me in as yet another brick collector. Two huge piles in my yard, waiting to become a patio and walkway. I have recently been getting a great quantity on Freecycle (if you haven't heard of it, check it out), as well as finding various hidden paths under the grass in our yard. The most epic free brick acquisition, however, was in historic section of Savannah many years ago. We found a construction dumpster full of really nice OLD bricks. Two pickup truck loads later, my friends had a beautiful new patio. I find it crazy that someone was going to throw them away. Stefan, if you look closely you can see some differences in the rear carrier...it looks a bit more streamlined. I've also seen the Prana online and was surprised at how it looks exactly like a Mundo...now it makes sense why. At any rate, I am happy with my v3 and plan on riding it for a long time. Max, I originally had a v1 and sold it to purchase the v3. They (Yuba Mundo) said somewhere that it was 12 lbs lighter than the v1 but I don't know...it's still heavy. Maybe 5 lbs lighter. I can't imagine they can shave off too much more weight without compromising its load bearing capacity. As it stands now it--out off all the long-tails on the market--is built to handle the heaviest loads (and still ride like a normal bike). To handle any heavier loads you'd have to use a trike or a box bike I'd imagine. And yes...free bricks are awesome.